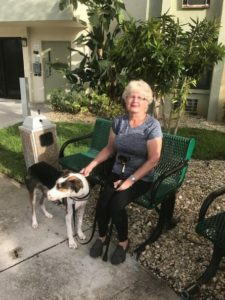 When Linda moved into Full Circle Communities’ Goodlette Arms senior living facility in April of 2016, she had a lot to look forward to. She couldn’t wait to be within driving distance of incredible shopping centers and health facilities. She couldn’t wait to make new friends at movie nights, or learn Spanish in one of the complimentary language classes. But most of all, she couldn’t wait to live in the middle of Naples, long considered one of the most desirable cities in the state. But one thing she wasn’t expecting to look forward to was the high quality free health services she receives as part of her amenities. Linda, who has beaten cancer in the past, recently suffered a stroke that profoundly impacted her quality of life. Because her dominant hand was one of the most significant areas impacted by the stroke, she struggled to complete everyday tasks. But Linda’s always been a fighter, and she was determined to rebuild her strength and independence in spite of those impediments. Luckily for her, Goodlette provides physical therapy sessions on-site, making it simple for her to make each of her appointments. Unfortunately, soon after beginning her regiment, Medicaid stopped covering her treatment. Linda, like a significant percentage of Goodlette’s residents, falls in a Medicaid coverage gap: her assets are too high to qualify to receive subsidized care, but too low for her to afford those services on her own. With Medicaid unable to cover costs, Linda’s ongoing recovery was profoundly endangered. Full Circle was unwilling to see this happen to one of their residents. They stepped in, announcing that they would cover all costs related to Linda’s physical therapy. Linda was awestruck by the generosity; no longer would she have to worry about her finances and could instead focus exclusively on healing. She feels so lucky to have Full Circle in her corner, and wishes everyone could have the opportunity to live in a community like Goodlette Arms.